Where Are You From, Madame Goldfinch? Folks who have heard of Hilton Pond Center but never visited sometimes ask what we learn from banding birds. Our usual response, delivered with a sincere smile, is to come see for yourself and the answers will be obvious. 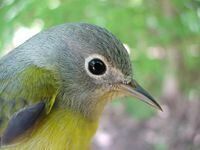 We DO learn a lot from having birds in the hand: the subtleties of color or markings that barely show through binoculars; age--and in some sexually monomorphic species--whether a bird is male or female; or even the bird's readiness for migration, based on whether sufficient yellow fat is stored around the wishbone. Of course, many of these things could be learned from a stuffed museum specimen, but there is much we would not know about birds unless they were captured, banded, and released to live another day. We were reminded again this week of just what science can learn about avian ecology and behavior when a banded bird is eventually recovered or recaptured. On 24 September--the morning after our first significant downpour at Hilton Pond Center since early summer--birds were noticeably more active than they had been in weeks. It was still drizzling, so we weren't able to unfurl the mist nets we use to catch birds from early spring through late autumn. We did, however, bait a trap with sunflower seeds and at 10:30 a.m. were pleased to see that it had snared six American Goldfinches (Carduelis tristis). We removed the birds--two females (above) and four males (below)--and took them inside for measurements. 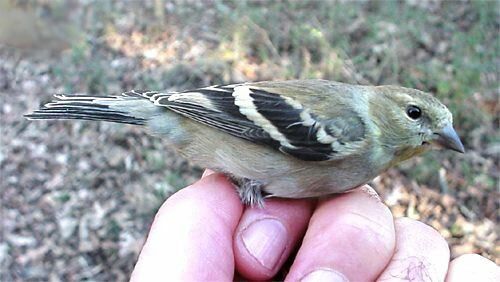 Upon release, each newly banded bird took off in that erratic flight pattern unique to goldfinches, and each sounded its typical goldfinch chitter. Shortly after lunch there were five more goldfinches in the trap, and as we removed them we noticed one was already banded. It's not unusual to band a goldfinch and recapture it within hours--free food is a pretty strong stimulus for any bird to repeatedly re-enter a trap--so we weren't all that surprised. However, as we looked at the banded bird's leg, we saw a number that didn't quite seem familiar and made a mental note to re-read it after taking the birds inside. With almost 40,000 birds banded at Hilton Pond Center since 1982, we sometimes forget all our four-digit prefixes and five-digit number series. We quickly measured and banded the first four birds and released them, and turned our attention to the remaining individual. It was apparent from its plumage--drab olive-yellow body and brownish-black wings--that this bird was a female, and the widely rounded tail feather tips indicated she was an adult. Using a hand lens to make sure we read the number correctly, we recorded 2200-43094 in a notebook reserved for recaptures. The number still didn't sound quite right, so we consulted our other notebooks in which new captures are recorded. We have used lots of different band series on 4,347 American Goldfinches over the past 19 years, but no matter how many times we looked at our list, we were unable to find a prefix of 2200. And why is that significant? Because if it wasn't one of our local-banded birds, it most have been banded by somebody else. This is the kind of thing that bird banders live for--catching someone else's bird or having one of your own birds encountered elsewhere--and it is the main reason why we band birds in the first place. 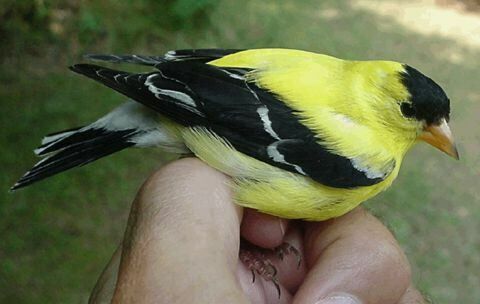 If we knew who banded this bird and where and when, it would provide us with accurate information about wild American Goldfinches that can't be acquired in any other way and, in particular, we would know something about the bird's longevity and migration patterns. 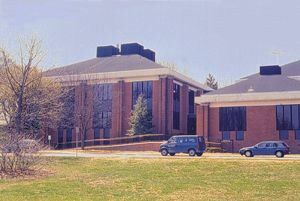 Based in Laurel, Maryland, the federal Bird Banding Laboratory (right) oversees all banding activity in the U.S., and it has a toll-free number through which the public can report banded birds. So we dialed 1-800-327-BAND and were connected immediately to a staff member with access to a computer database of all the millions of birds that have ever been banded. We carefully read off those magic digits of 2200-43094, and within a minute or so the clerk came back with the information we eagerly awaited. "American Goldfinch. Banded as an adult female on 12 July 2000. Banded under the permit of John Miles. Banded near Dunnville, Ontario, Canada." Dunnville, CANADA! On the north shore of Lake Ontario! How incredibly amazing! This little bird, which weighs less than ten grams, had been banded more than a year ago, and today it showed up at Hilton Pond Center--560 air miles from a location where it likely had bred last summer. Even if you're NOT a bird bander, this IS exciting stuff! What makes it even more exciting is that despite our banding of almost 40,000 birds of 122 species, this American Goldfinch was only the SEVENTH bird banded elsewhere that we've recaptured. It was also our first "foreign" goldfinch from another banding station, and our first bird from outside the U.S. (see map below). Since 1982, we have re-trapped three "foreign" Purple Finches (Carpodacus purpureus) and three House Finches (C. mexicanus)--all but one from a rather narrow migrational corridor in the eastern U.S. (see map above). One "aberrant" Purple Finch was banded in February 1993 at Lux, Mississippi--the very southern end of its wintering range--and recaptured 11 months later here at York, South Carolina. The other two Purple Finches came from St. Thomas, Pennsylvania, and from--of all places, Laurel, Maryland--home of the Bird Banding Lab. What brought us real joy about the latter bird was that it had been banded by Chan Robbins, author of the Golden Field Guide to Birds of North America--the very book from which we first started studying birds. 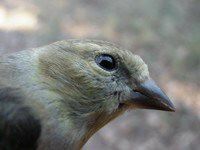 After getting his phone number from the banding lab, we called John Miles to talk about his wayward goldfinch. We learned the bird had actually been handled by Jim Smith, one of John's subpermittees who bands at Rock Point Provincial Park, just east of the mouth of the Grand River that flows into Lake Ontario. John has been banding for 40 years and has had birds recovered all over the Western Hemisphere, but he was just as excited as we were about our recapture of his subpermittee's American Goldfinch at Hilton Pond Center. After all, the hope that a bird will be encountered elsewhere is what keeps us banders energized on the hottest days of summer and the short, dark days of winter. Wonder where Madame Goldfinch will go next? In 2001, informative and entertaining hummingbird banding presentations were held at four Carolinas locations for more than 500 participants. For more info, and especially if your group would like to host "Hummingbird Mornings" in 2002, click on the hummingbird drawing at left. Hilton Pond Center for Piedmont Natural History is a non-profit research & education organization in York, South Carolina USA; phone (803) 684-5852. Directed by Bill Hilton Jr., aka "The Piedmont Naturalist," it is the parent organization for Operation RubyThroat. Contents of this website--including articles and photos--may NOT be duplicated, modified, or used in any way except with the express written permission of Hilton Pond Center. All rights reserved worldwide. To obtain permission for use or for further assistance on accessing this website, contact: WEBMASTER.